With the victory, Uruguay claims Group A.
SAMARA, Russia — Luis Suarez finally got rattled at this year’s World Cup. Sitting at the podium in the post-match news conference following Uruguay’s 3-0 victory over Russia, a reporter asked him why he often wore a sad expression. 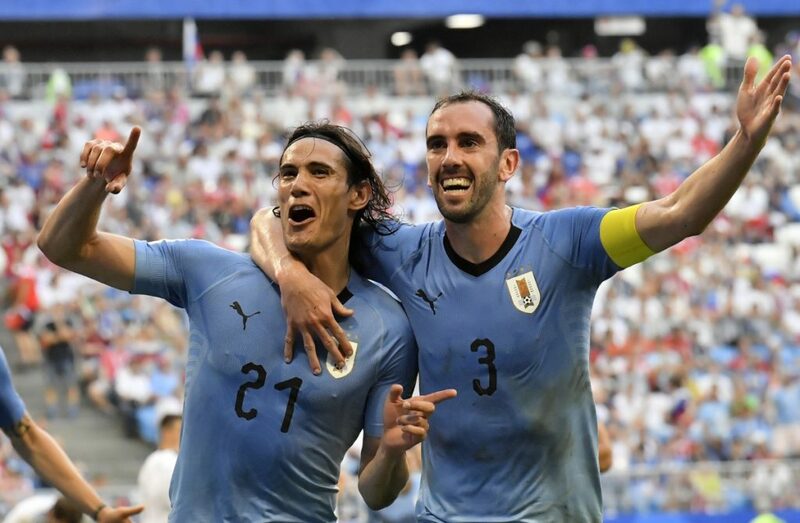 Both teams were already assured of spots in the knockout round, but Uruguay’s victory put it at the top of Group A and looking toward a match in Sochi on Saturday against Portugal. Uruguay, which also benefited from an own-goal in the first half, had its third straight shutout of the tournament after consecutive 1-0 victories over Egypt and Saudi Arabia. The Uruguayans and goalkeeper Fernando Muslera have not allowed a goal in any of the team’s six matches this year. Suarez, who seems to have put past World Cup controversies behind him, scored with a low shot from just outside the box that sailed past the wall of Russian players and into the right corner of the goal. The Barcelona striker then blew a kiss to the national team’s fans. But his two past World Cups have been marked by controversy: He was sent home from Brazil four years ago for biting Italy defender Giorgio Chiellini. In 2010, he used his hands to block Dominic Adiyiah’s header and then celebrated when Ghana missed the penalty kick. Uruguay prevailed in a shootout, and Suarez was marked as a dirty player. Uruguay took a 2-0 lead over Russia on an own-goal — the sixth of the World Cup to tie the tournament record. Midfielder Diego Laxalt’s shot from long range deflected off Denis Cheryshev’s foot and past goalkeeper Igor Akinfeev. Cavani scored in the 90th minute and was taken out a short time later. The Paris Saint-Germain forward put a rebound into the left corner of the net after Diego Godin’s header was parried by Akinfeev. Defender Jose Maria Gimenez didn’t play for Uruguay because of a right thigh injury. Gimenez scored in the team’s opening match of the tournament, a 1-0 victory over Egypt. The team did not say when he might return. Russia’s home-country advantage could only carry it so far against its more experienced opponents. But the Russians had recent history to think they were up to the challenge: The teams played to a 1-1 draw in a 2012 friendly in Moscow.